Often when I’ve had the time to prepare a large cut of meat like the recent whole pork shoulder I rubbed with spices and slow roasted in the oven, I do it with ulterior motives. Like making meatloaf so I can have a sandwich a day later. Or braising a piece of beef chuck so I can slather mustard on crusty slices of bread to wrap around cold pieces of the simply prepared roast that was a childhood favorite. I won’t deny that sitting at a table with friends and family to enjoy a meal of roasted, braised, or grilled beast is the best of occasions, but there’s something to be said about that one-of-a-kind sandwich at the other end of it all. One I can’t have if all the work doesn’t happen first — or worse — yields no leftovers. Waiting the best of several days for a 10 lb. cut of pork to thaw if it’s been in the freezer, then sit dressed in its dusty spice covering to finally roast over a pan of apple juice for hours is all worthwhile when I know I’ll be able to bite into a pulled pork sandwich. As much as I can say I’ll take a nicely stacked sandwich any day if the right ingredients are wedged into those layers, I’m fairly new to pulled pork. Most of the pork I ate growing up was in the form of bone-in chops my mother fried in a cast iron skillet with a sprinkle of salt and pepper. I remember enjoying the flavor of those chops, but the texture always seemed dry so they were never a favorite. Because I ended up being the family cook at an early age, I can tell you the dryness had to do with the length of time I was told they had to cook — sitting in a hot frying pan to brown for 30 long minutes. I think I began to buck the system around junior high when I decided to use a lid and lowered temperatures to keep them from turning to leather. I also remember switching to a blade cut which came off the shoulder instead of the loin. It’s all about that fat. But there was something I didn’t like about the fat around the chops that crisped as they fried — the crispy fat my mother enjoyed. I remember her rescuing the pieces I’d cut from my chop, popping them into her mouth while I cringed at the thought of chewing on a solid piece of fat. In spite of what we’re told about eating saturated fat, at nearly 75, my mother’s blood pressure, heart, and arterial health are considered excellent. Suffice it to say she didn’t eat pork fat — or any fat with any degree of regularity. A little pork fat goes a very long way with me — I even like my bacon lean — so a slow roasted pork shoulder where the marbling of fat melts to tenderize the meat is perfect. 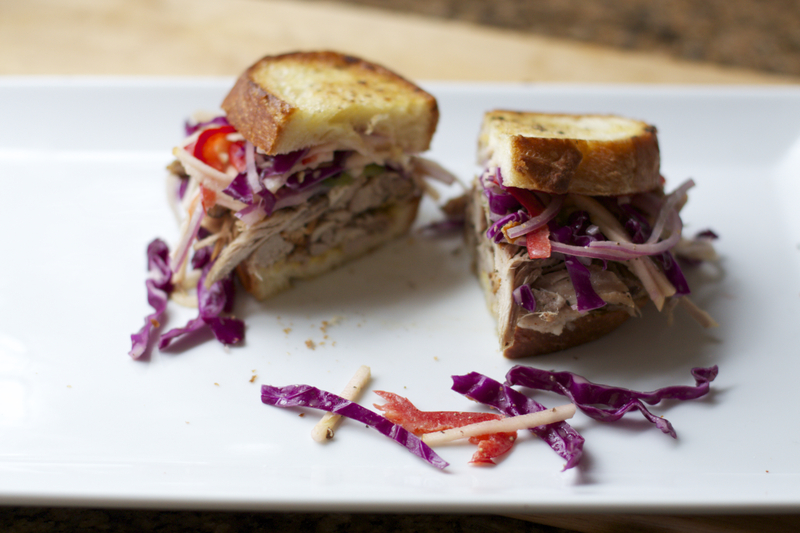 Perfect as in a sandwich filled with layers of it nestled underneath a just right slaw. A little bit of sweet, then tart, a touch of heat, and a whole lot of crunch work quite well with the pork. It’s far from traditional, but that’s why I like it. If you’re someone accustomed to pulled pork treated to a dousing of sauce, I’d understand if you cried foul here, but I think this is worth a try. Sometimes when something is sauced, that’s all I can taste, and then there are those added calories which always seem to include sugar of some kind and lots of salt. 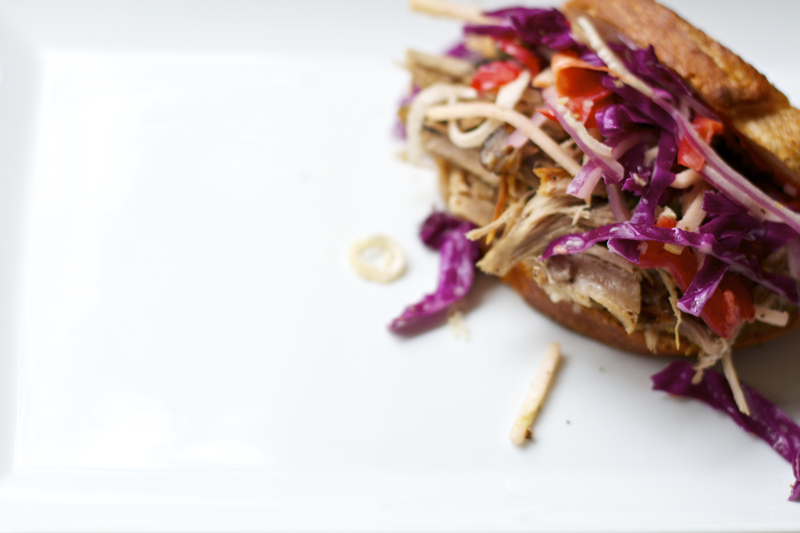 Load the bread with the spiced pulled pork shoulder, load even more of the veggie slaw, and take a big bite. Or skip the bread all together and make a salad. But try it. And then we’ll talk. 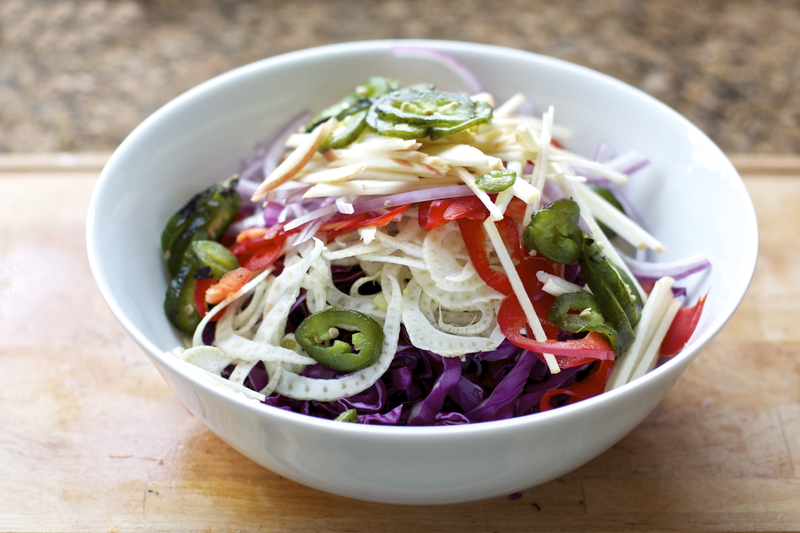 Combine all slaw ingredients in a bowl. Add dressing ingredients to a small lidded jar and shake well to combine. Taste to correct seasonings. Pour over slaw ingredients and lightly toss. Allow to sit 15-20 minutes. Brush one side of two pieces of bread and toast under the broiler on in a skillet until lightly browned. 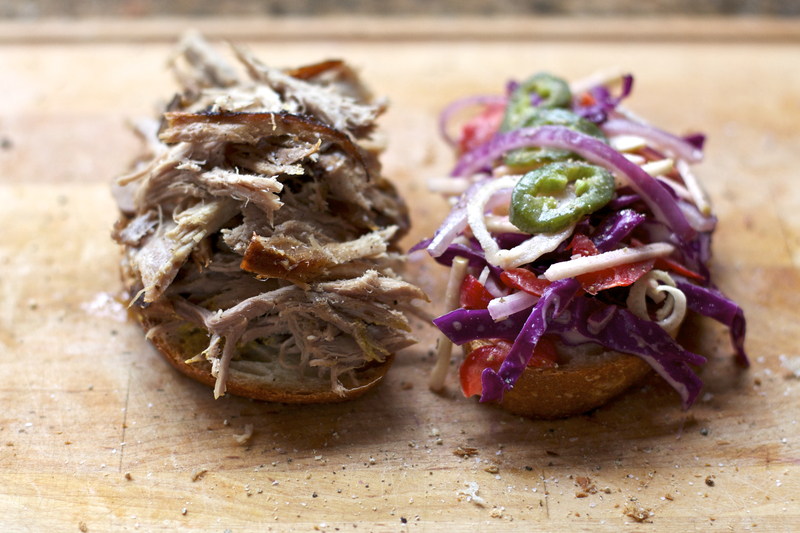 Load the pulled pork onto the untoasted side of one piece of bread and slaw on another. Slap the sides together and enjoy. I am not someone who grew up eating fennel, so I’ve had to experiment with it slowly over the years. Its licorice flavor is not always appealing to me, but I’ve enjoyed small quantities of it mixed with the right combination of ingredients. When I’m experimenting with a relatively unfamiliar food like fennel, I pick it up at the market with no idea in mind of what I might do with it. Doing several searches usually turns up something for me to try but if I’ve got other ingredients around, I’ll usually conduct the search including two of them. 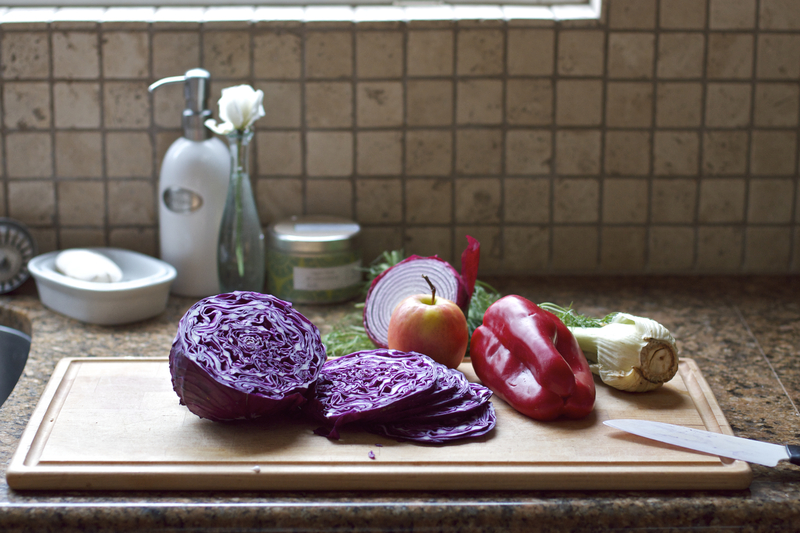 In the case of this slaw, I added the cabbage and apple. 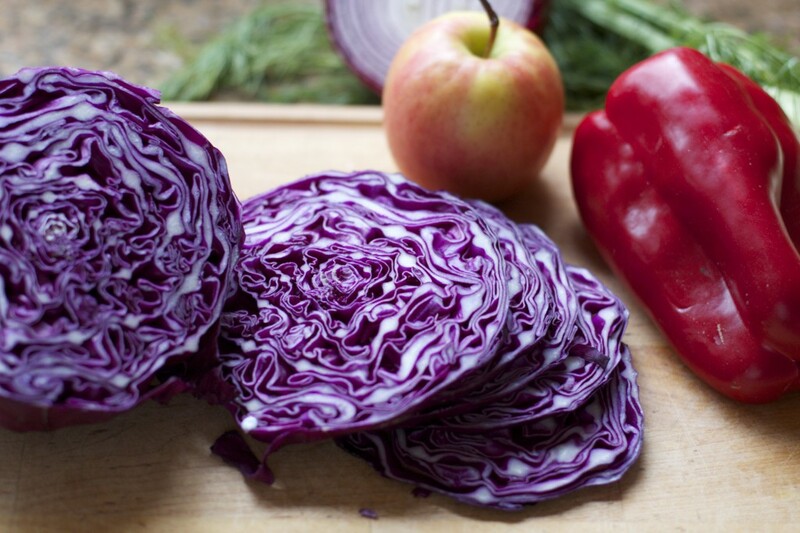 I knew fennel’s slightly sweet but distinctive flavor would compliment other sweet flavors like apple and cabbage and the red pepper is added for color, additional crunch and sweetness of a different kind as well as gorgeous color. Food needs to look good, right? 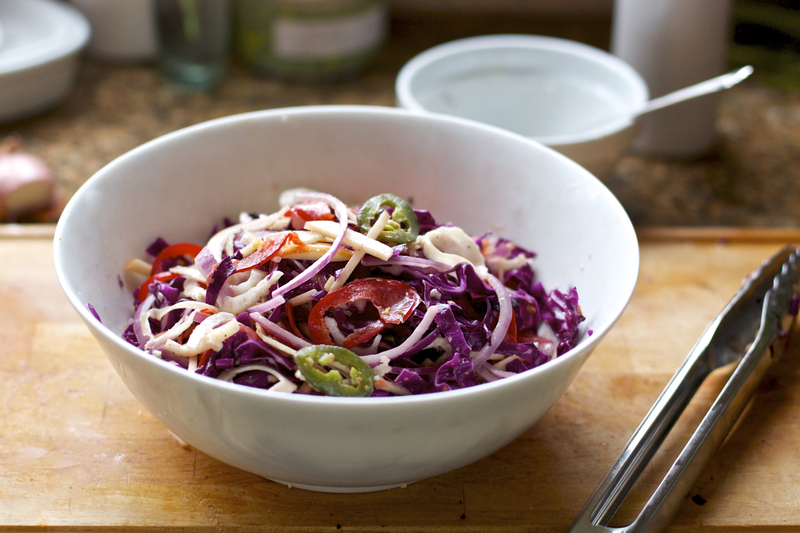 After finding several different versions of this slaw, I chose this one from Rosemarried to adapt mine. 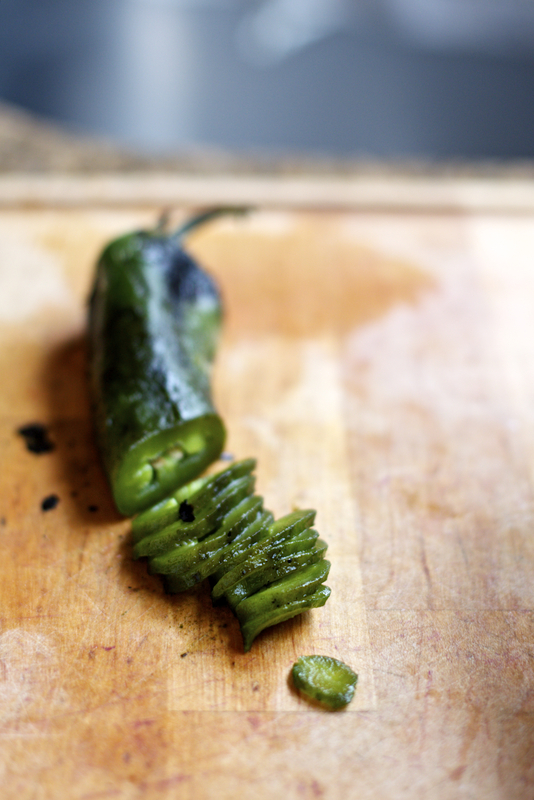 I liked the addition of the jalapeno. 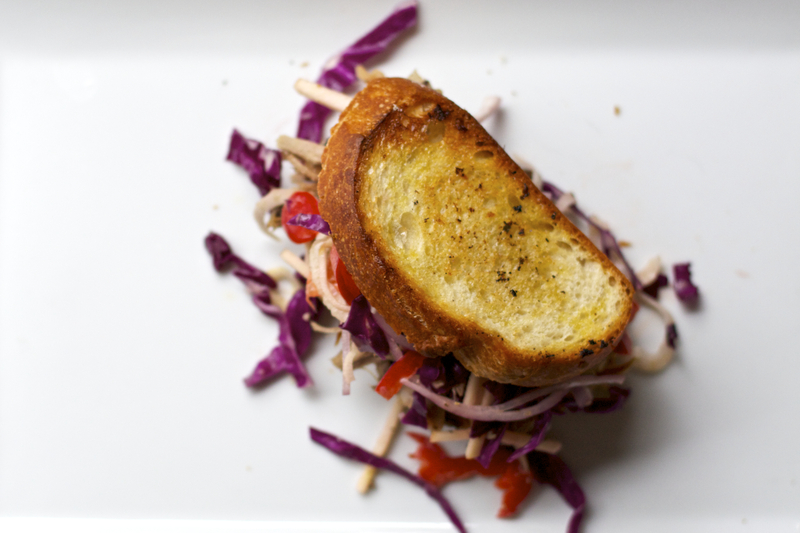 I think apples in general are a nice compliment to pork, so the overall flavor of this slaw works very nicely. All the flavors work well together. If you want to make a panino of this, then load the bread without toasting first and place in a skillet making sure to weight it down with a smaller skillet, then flip to toast the second side. This would be a great sandwich to add some cheese to — especially a gouda or mild jack. About the pulled pork: Make sure it’s heated well before making the sandwich. Mine had been in the fridge since the night before, and I’d pulled quite a bit of it and separated it into baggies. I used the microwave on a low setting to warm slowly about 2-1/2 minutes, then tossing it and popping it back in for another 30 seconds or so to finish it. 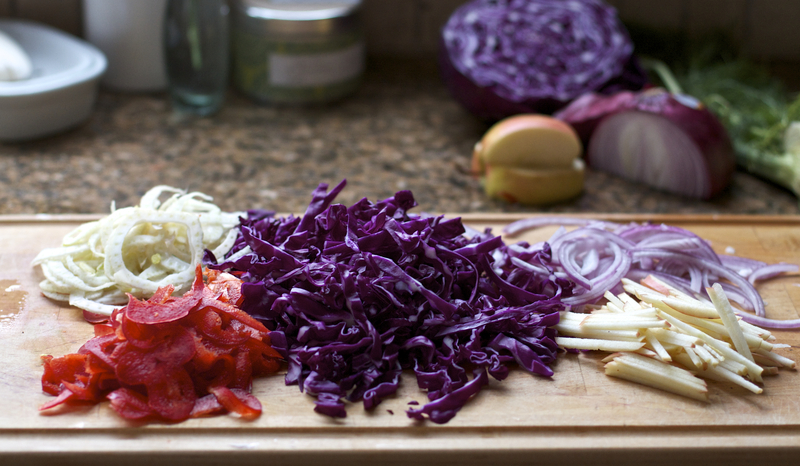 The slaw is a great side dish to any barbeque and is better if it’s allowed to sit quite a while. For an even lighter dressing, skip the olive oil and add a spoon of plain yogurt and shake in the jar with the other ingredients. If you’re eating the way I have been, you eat only half of this sandwich and call it lunch. My weigh-in this morning showed I’ve lost a total of 21.6 lbs. since January 4th when I set out to be more healthy. I’m almost half way to my goal!